A recent job transfer has changed my home away from home from Columbus, Ga to the Rocket City. 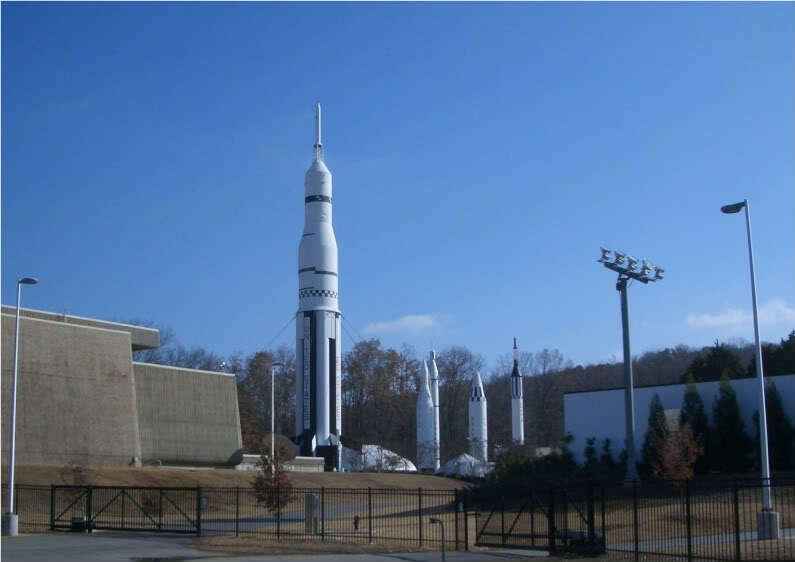 My home is still in Marietta Ga but I now have an apartment in the Rocket City AKA Huntsville, Alabama. I spent three years in Columbus but I really didn't do much while I was there, or take the time to explore the area. I decided that things would be different in Huntsville. What better way to explore a new area than on two wheels? Just to make things more exciting, how about doing it Full Throttle? Stay tuned. If I don't get arrested I will be posting pics of my exploration of the area. donteatmyfood and The Virginian like this. If you have read any of my previous ride reports, you know that they are all about riding in the mountains, on curvy roads, unpaved roads, crossing creeks, getting away from civilization and traffic. This will be different. it will take a different frame of mind. To live up to the title of this ride report, it will also take a different machine. Smaug1, Halen, durtwurm and 5 others like this. ... I was expecting a Ruckus. When I got to Huntsville nearly 2 months ago, I did what I always do when I come to a new city; I check out the local motorcycle shops. 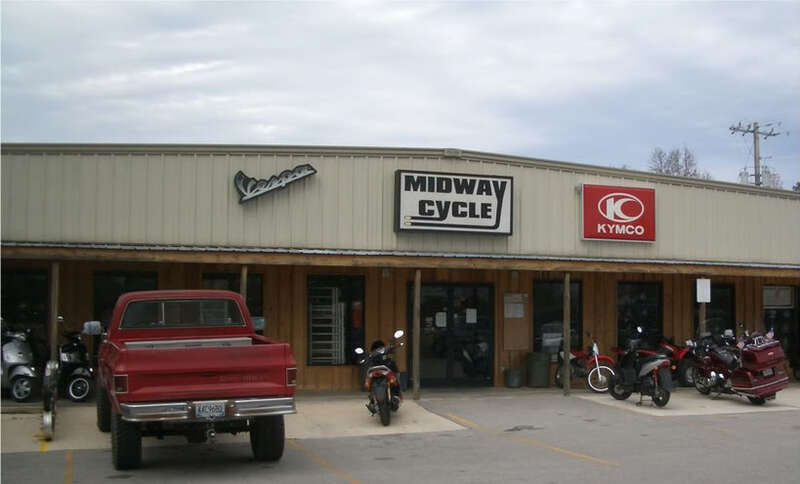 The first one I stopped at was Midway Cycles in Madison. As you can see they sell Kymcos and Vespas. They had their Kymco Scooters marked way down. The wheels in my head started turning Or was that the gears in my head grinding? Ever since I rented a Yamaha Riva 125 in Hawaii in the late 80s, and had a blast on it, I thought I would like to get a small scooter some day. For running errands around town, it's hard to beat a small scooter. Saves money on gas and wear and tear on the cage. More importantly it would get me out of the cage and on two wheels. To make a long story short, I did some research. Kymco has a good reputation and a major scooter manufacturer. They have an extensive dealer network in the US. They probably have more dealers than BMW. 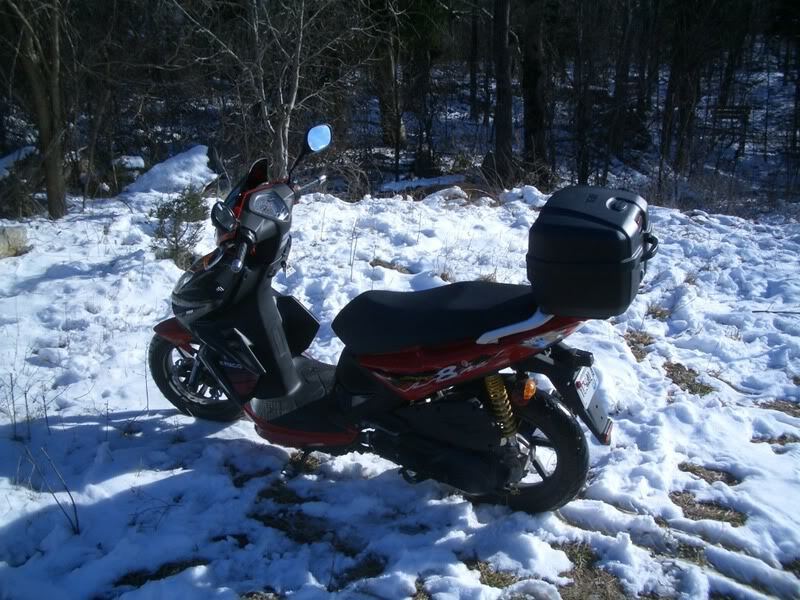 I narrowed my search down to two scooters. The dealer prepped and let me ride both. How many Japanese motorcycle dealers would do that? This is what I got. 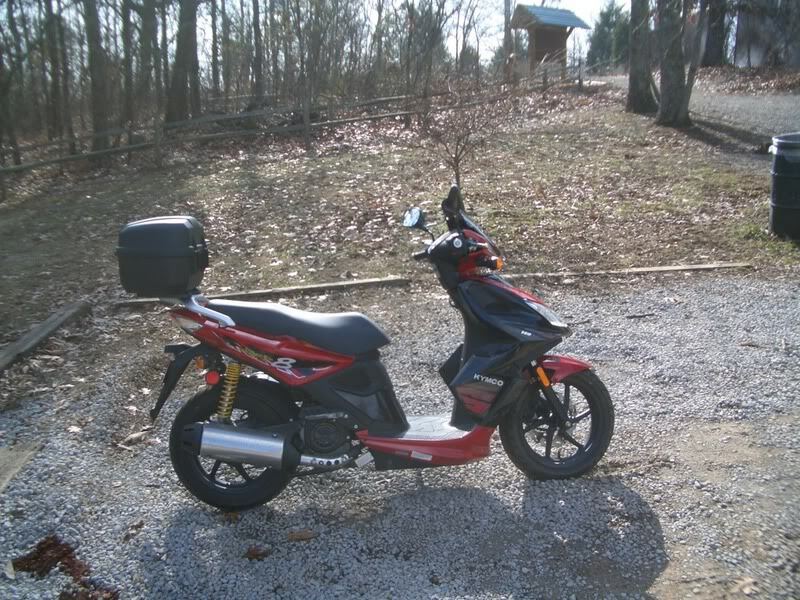 It's a new 2009 Kymco Super 8 150. Under $2200 OTD including Tax, Tag, and Title. MJSfoto1956, Smaug1, durtwurm and 1 other person like this. In case you're wondering about the title of this report, 150 is for the number of CCs of my new scooters engine. Full throttle? With only 11 HP (claimed), full throttle will be required to keep from getting run over. 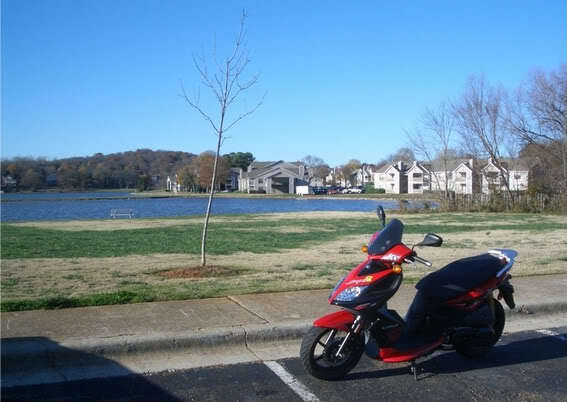 This is my first scooter after having owned a large number of motorcycles so it would be an adventure even if I wasn't exploring a new area. The first adventure came quicker than expected. When I tried to load it in my truck, it grounded out and got stuck on the top of the ramp. 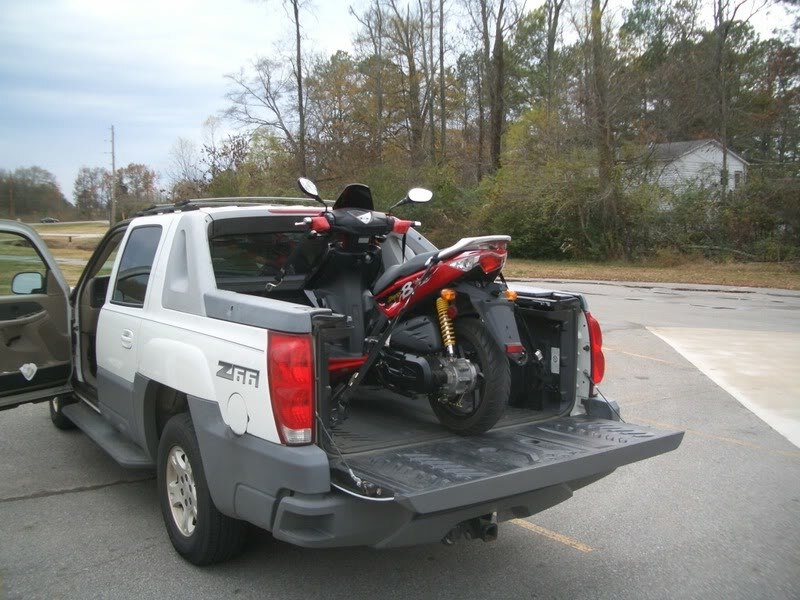 It doesn't have the ground clearance of my dual sport bikes and the angle of the ramp was too much. luckily someone saw my predicament and help shove it into the truck. I have constructed an extension for my 7 foot ramp but haven't had a chance to try it out yet. Here it is in the back of my truck. The next challenge was to ride it while "attempting" to adhere to the recomended break in speed, 40 MPH for the first 600 miles. That ain't gonna happen but at least I tried to keep it under 40 as much as possible until I did the initial 300KM oil change. I did some riding trying to keep it mostly on residential roads near my apartment. I also took some pics. My apartment is right by a small lake. My first pic was with the lake in the background. Huntsville has a lot of wetlands and also a large number of birds. I added the tail trunk to my scooter give it enough storage capacity that I could use it to go shopping and carry a reasonable amount of stuff. It also has storage beneath the seat, although it is not quite large enough for a full face helmet. The tail trunk may look large but that is partly due to the small size of the scooter. It will barely hold a full face helmet. That is an excellant price for a new Super 8 150. What other scooter did you test ride? I just bought a new leftover Kymco People 150 to keep at our place on the Big Island of Hawaii that we rent out to vacationers.We'll be moving there a little later.Gas prices are a lot higher bthere than in the Seattle/Tacoma area in Wa. State.The dealer, Kisers Motorcycles in Kona was having a sale on the 2009 People 150s, and it was $2390 out the door with everything.The Super 8 (the other scooter I waqs interested in) was abnout $100 more.I won't see my new scooter until Feb. when we are there for eioght days.Since there are no SYM,Vespa,or Genuine Scooters dealers on the Big Island that left Honda,Yamaha,Suzuki and Kymco.I went with the Kymco because the price was better, and they are a quality scooter with a two year warranty, while most others (except SYM-also two years) give only a year. I like that Super 8, and thought if I got one of those, I would have got a green one just to be different. I initially considered the Agility 125, People 150, People 200 as well as the Super 8. I eliminated the Agility 125 quickly since i didn't fit on it, I'm 6-2 and my knees hit the handlebars. The People 150 was also a tight fit for my size 12 feet and it just had less storage than the Super 8. It was a good deal at $2350 OTD. They had a People 200 for $2550 OTD. I test rode the 200. Very comfortable and more power than the 150s but it handled like crap. It did not like being leaned over - it just felt wierd. Since I love riding fast on curvy roads - the tighter the curves the better, there was no way I was getting the 200. The People 150 does have some advantages over the super 8 and I probably should have tried it but I'm happy with what I got. So far I really like the way the Super 8 handles. It has fairly wide 14" tires and it feels like a small sport bike. I think the 14' tires are a great compromise between the small wheel 12' and big wheel 16" tires. I also like the brakes, good power and feel, AND THEY ARE NOT LINKED. I DESPISE LINKED BRAKES. I've been taking it easy with the throttle untill I get it broken in so I can't really comment on the power but I suspect I will wish for a little more. The seat on the Super 8 is fairly hard and not shaped that well. It hasn't been an issue since I haven't taken any really long rides but most likely I will end up modifying the seat. Hey klaviator...I was born and raised in Huntsville; live in Madison now. 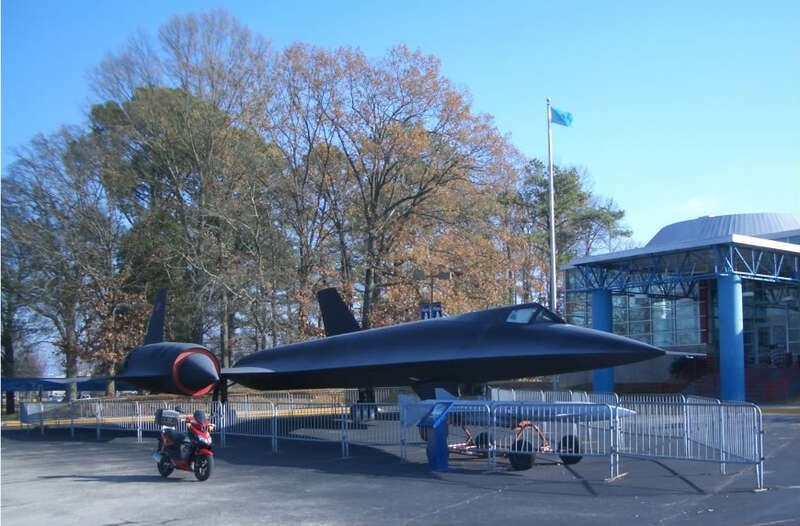 The interstate in front of the space museum.....many a full throttle sportbiker has met their maker on the west bound side. In the curve just as they approach the Rideout Rd overpass. It's a tempting high speed curve. I've been at over 150 mph on it myself. I don't recommend it. As a long time motorcyclist, the best thing about Huntsville is it's only a few hours from the Smoky Mtns. 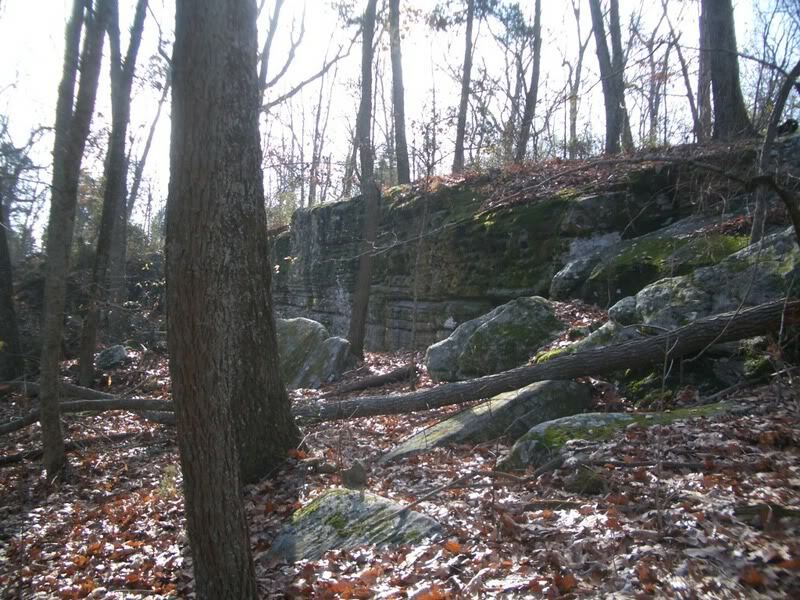 There are some decent trails over in Bankhead National Forest just East of Decatur. 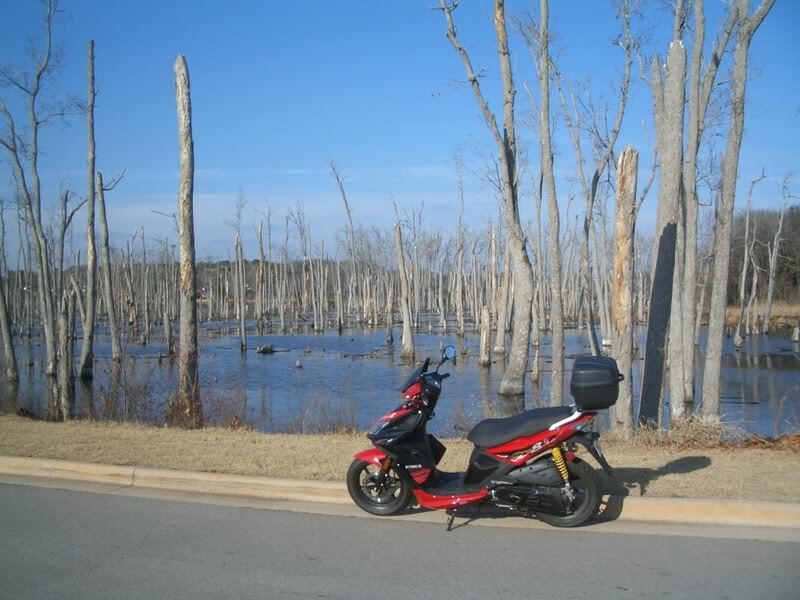 For road riding look for towns like Skyline, Hytop, Hollytree. Take a ride up to Winchester Tn. .....Head East on Hwy 72. Turn left on Hwy 65 in Paint Rock. Turn right on 146. Turn left on 79. You'll find Huntsville has a lot of people with ample money. You'll also discover it has so many H-D's you'll want to stick your finger down your throat each morning. 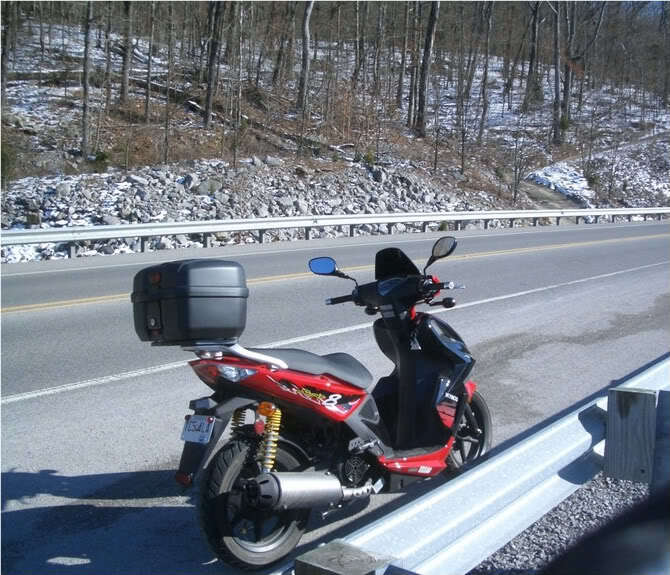 Little River Canyon (Hwy 176) is a nice ride. CMS and Smaug1 like this. Thanks for the info. I've been to the Cycle Gear. So has my credit card . I'll be sure to check out the other stuff you mentioned. I have always been drawn to the mountains. In the middle of Madison sits Rainbow Mountain. It's not much of a mountain, probably only a few hundred feet above the surrounding area. Still it does stand out and I just had to check it out. One of my favorite things about roads that go up mountains is that they tend to have curves. Then add in typically nice scenery and views and you have something I can't resist. So I decided to ride to the top of Rainbow Mountain. I found a few things at the top. There was also a small park and some hiking trails. I plan on coming back and doing some hiking but I wasn't dressed for it this time. 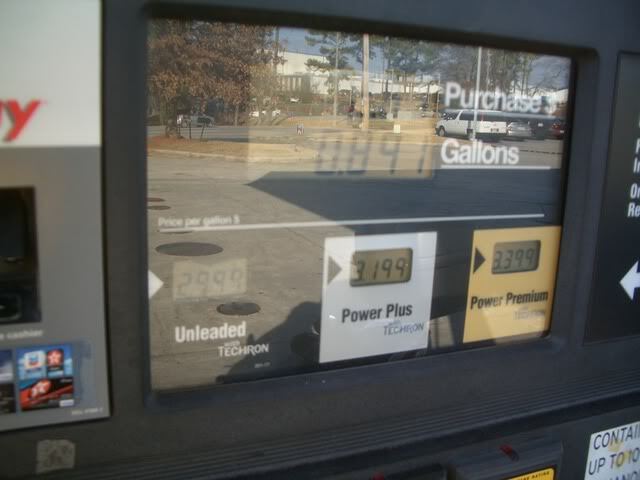 That was my second fill up. 80 MPG Not so good is the tiny gas tank. Officially 1.35 Gal but the fuel guage hits empty before I have used a gallon. One of these days I'll run it empty and see how much it will actually hold. I'll just bring along some extra gas in an aluminun fuel bottle. 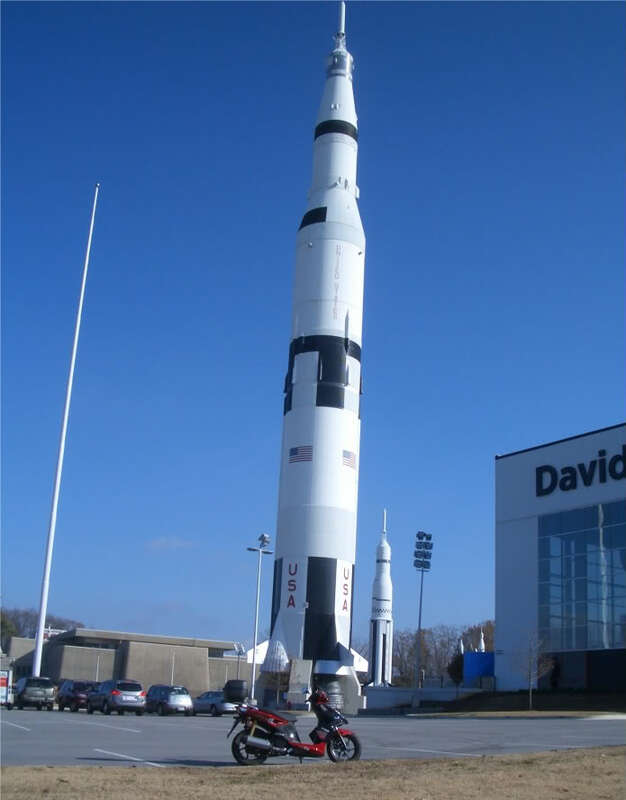 One of the most impressive sights in Huntsville is the giant rocket at the Space Center. You can see it miles away. I took a ride there to get some pics. The first two pics in this report were taken there. The next one shows the biggest of the rockets. I didn't go into the museum but it's on my list of things to do. codeDirtyToMe and Smaug1 like this. I left town before Christmas and went to the Memphis Area. When I got back, it looked like a cotton factory had exploded. Yes, it does snow down here in the deep South. It was around 40 degrees and sunny. Perfect day for a ride. I decided to explore the mountains on the east side of Huntsville. 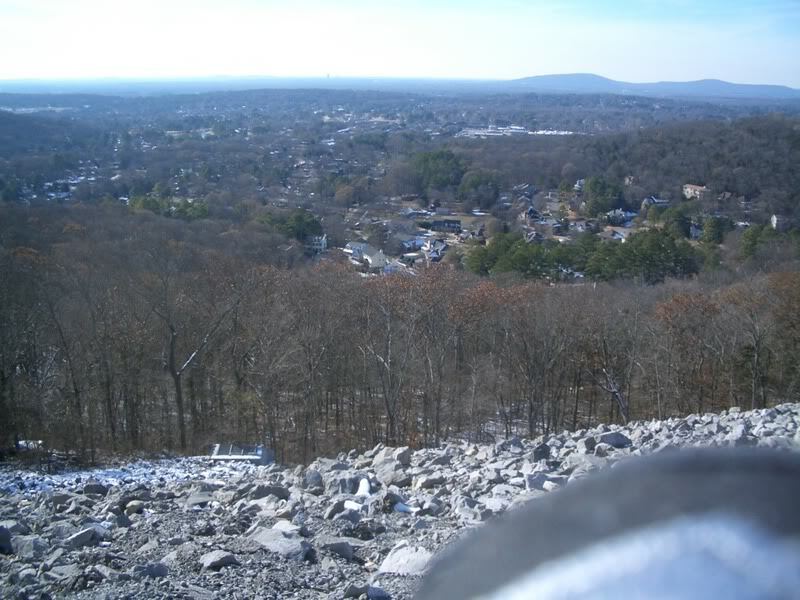 Looking over Huntsville to the West. Being the expert photographer that I am, I managed to get my finger in the corner of the picture. Bikes always look cool with a white background. I recently figured out how to use the timer on my camera. 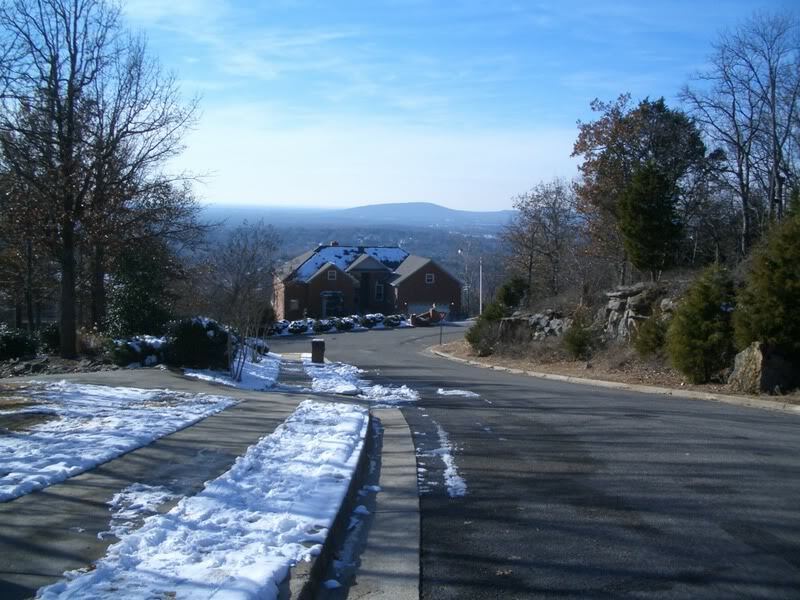 I decided to check out the view from one of the expensive neighborhoods on the mountain. The Original Crum, Smaug1 and durtwurm like this. Nice pics and nice scooter you got there! 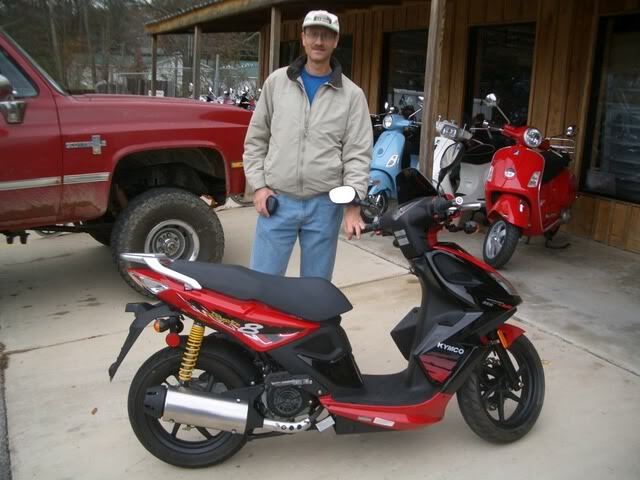 Looks like you are having as much fun on your Kymco as I am with mine. These 125-150cc, small frame scooters are a hoot to ride! I really like my Agility 125, but if the Super 8 150 been available in 2008, I probably would have gone for the Super 8. One thing you can just about count on with scooters and motorcycles. 1.if it has a fuel gauge, it will noot be accurate. And 2.the speedometer will read between 5% and 20% high.My Sportster runs just a couple of mph high.My wife's SYM HD200 reads more like 5mph high. 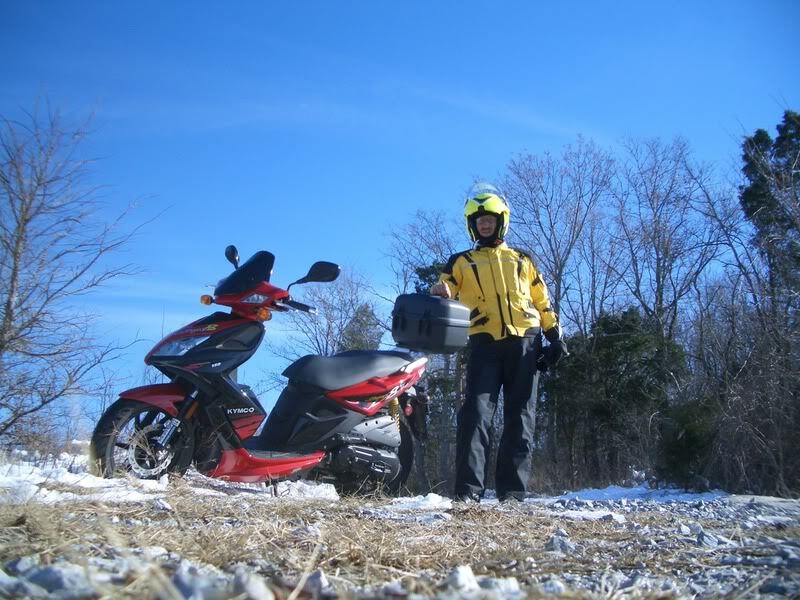 And by the way, I use every possible excuse to ride my wife's SYM! Sometime I have to get creative. How can I justify riding her HD200 (with a top box/trunk) to the grocery store when a car was available? But I do it ball the time. I may have to one pound of coffee instead of five- but it's worth it. And it gets 75+ mpg.My Toyota Tacoma pickup gets maybe about 22 mpg. The 1992 Ford Explorer that was given to me when my Mother passed away gets like 12!! Oh well. Any excuse will do. My friend, you have nailed it there!! I have said for may years, that riding my motorcycle (or scooter) releaves the daily stress better than (almost) anthing else. After a rough day at work, I look forward to the ride home. To me a car is just a device to get from point A to point B.
Hello from another X-HSV resident and rider. My experiences are dated.. Living in SE HSV, behind Grissom High. Back in the 70s. This area had tons of trails. We would ride East from the Double Tree neighborhood. Smoke Rise didn't go much further North than Willow Brook, and the trails went from there. 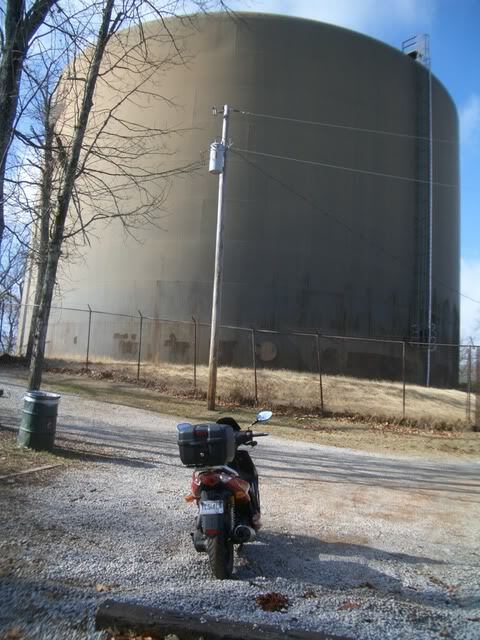 You could ride on top of the mountain further South/East than I ever explored I would get far south as Green Mountain, make a few laps around that like lake-park and head home, worring about gas. Small motorcycles were all over. Kids rode Honda Mini Trails to Whitesburg Jr. High, as you could get a permit @ 14yoa for under a certain CCs. There was a cool Motorcycle Shop on South Parkway. East side, near the location of a McDonalds today. They carried Hodaka and few similar makes. It disappeared maybe in the late 70s. KC's was the big dealer in town. They were on Govenor's Drive , just East of the Mall ( Home Depo I think is there today). They had Honda and Suzuki back then. Mid 70s another Honda Dealer popped up just off South Parkway,much further North then where KC's ended up before being bought out. They didn't last long. Thanks for the photos...keep them coming! Adventure is to be had. We just need to look for it. Thanks for taking us with.